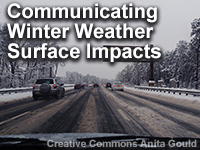 This lesson will introduce National Weather Service (NWS) forecasters to the benefits of pre-season coordination in understanding the critical needs of decision-makers, particularly the state and local Departments of Transportation (DOTs). The strategies used by DOTs to mitigate road impacts during the winter and how the NWS can best support their needs are also discussed. Learners will gain insight into the common methods of collaboration between the NWS and DOT, and the different types of winter weather events in which they work together. Learners will also practice communicating winter weather forecast information that best support the concerns of DOT, including working through a simulation to see the effects of their communication choices on DOT decisions. There were some inconsistencies in the final quiz which through me for a loop (e.g. different dates/times mentioned in the questions versus the answers), and also different impacts (e.g. snow covered roads versus icy roads due to freezing rain). Pre-Assessment was better than the final quiz. Many of the questions were unnecessarily complex. Many of the answers to them were way too complex and left open ambiguity and would often prompt follow up questions from partners. In most cases, shorter answers that directly answer the partner's question are much better rather than long drawn out answers that introduce confusion. Example, Partner, "What is your confidence in the snow amounts?" Forecaster's Answer, "Our confidence is medium. Amounts of 4-6 inches are expected but up to 8 inches are possible." Stop there! Don't add anything else unless asked directly. Another issue is the constant indication of telling partners like DOT of the impacts the expected weather causes. They know what they are. They should be well aware of what 0.1" of ice or 4-6 inches of snow will do to their roads. They will know it better than we will. We should not potentially give confusing information. I have seen this many times before. Stick to what we know. Great lesson with good specifics and operational suggestions. Great module to learn more about the interaction of the NWS and DOT. The case examples were well done. Some of the questions and material to answer the questions were a little bit in conflict. I scored 100% but the lesson could have been a little more clear. Great course centered on the needs of NWS Deep Core Partners. Well Done. Very useful as a refresher for briefing strategies heading into winter, or for newer meteorologists trying to develop briefing skills. A good overview in some ways, but there wasn't much that isn't already widely known. This is a good topic and needs to be put to good use in the Disaster management forums. This was a timely lesson with a good review of communication principles depending on the audience. Tailored more toward NWS employees, it does have usefulness to the private sector. A good and timely lesson. Perfect introduction to winter weather impacts and its effect on the DOT. Very good lesson! I learned great information for DOT assistance with forecasts. Describe how to develop trusting relationships with DOT agencies and public jurisdictions throughout the year and especially ahead of the winter season.